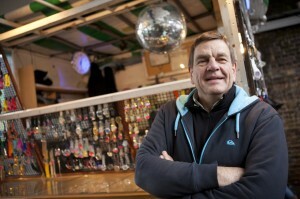 Brixton Market Federation’s Stuart Horwood is cycling to raise money for the NSPCC, writes Colette Webber. Setting off on 31 July for the Prudential Ride London to Surrey, he hopes to have achieved his fundraising target of £500. He has already raised £368 on his just giving page and you can still help him reach his target. The NSPCC chief executive, Peter Wanless, paid a surprise visit to Brixton to thank Stuart Horwood, for his fundraising efforts for the charity. 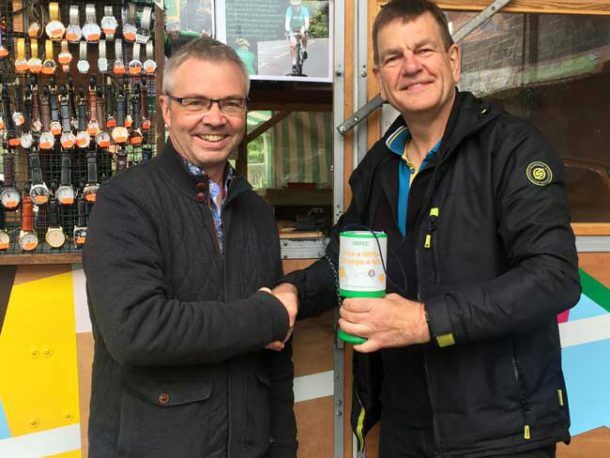 Horwood, chief executive of the Market Traders Federation, has set himself the challenge of a 100-mile bike ride in aid of the NSPCC. The Prudential Ride London to Surrey 100 takes place on 31 July.Donations are still being gratefully received. He chose the NSPCC as the charity he would ride for because of the important work it does with children. Peter Wanless NSPCC Chief Executive said: “Ninety per cent of the NSPCC’s funding is from individual donations. Efforts such as Stuart’s represent the foundations upon which the charity operates from. The NSPC is working in schools with children as young as five teaching them what’s appropriate behaviour and how to ask for help. Horwood aims to complete two 50 mile rides a week in the lead up to the cycle ride – a far stretch from his daily commute into Brixton of eight miles. The NSPCC is a national charity that work to prevent child abuse and neglect and offer support to those who have suffered such abuse. It operates ChildLine, a private and confidential service for children and young people up to the age of 19. Call free on 0800 1111 to have a one to one chat.